I started using MedBridge this year after researching multiple online CEU options. MedBridge Education continued to rise to the top of the list, so I made my decision and wanted to share my experience by writing up this MedBridge review. *** Update *** MedBridge has agreed to provide my readers with a 46% off MedBridge Coupon. Use the MedBridge promo code: “PTProgress” to save $175 on MedBridge, their largest discount available. As a current Physical Therapist and former financial advisor, there are three key factors that I use when making a decision to enroll in a continuing education course. Cost – does it make financial cents? Quality – does it hold up to the highest standards? Convenience – does it save me time and energy? When a weekend CEU course costs $500+, it may meet the criteria of convenience and quality, but the cost is often the limiting factor. If travel or time off is required, that $500 can easily double or triple, significantly raising the average cost of the earned CEUs. Attending an in-person course has its place in continuing education, but with current technology, you have access to the leading experts in your field without incurring travel expenses or extra time off. Does MedBridge pass the quick, 3 part question of cost, quality, and convenience? 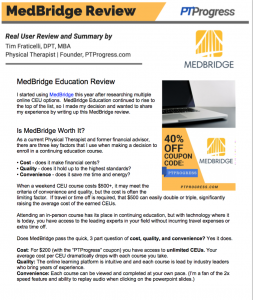 Cost: For $200 (with the “PTProgress” coupon) you have access to unlimited CEUs. Your average cost per CEU dramatically drops with each course you take. Quality: The online learning platform is intuitive and and each course is lead by industry leaders who bring years of experience. Before we dive into the MedBridge platform, I want to talk a little about the company itself. 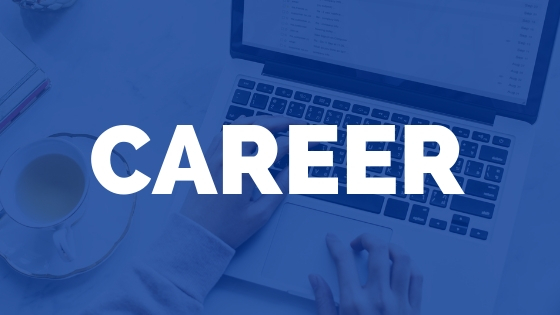 MedBridge started in 2011 as a resource for Physical Therapists and soon expanded into courses for Occupational Therapists, Speech Language Pathologists, Athletic Trainers, and even Nursing CEUs. 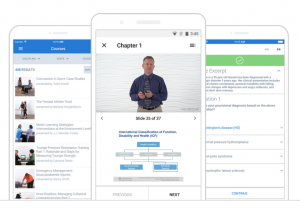 Today, over 70,000 clinicians use MedBridge and have access to over 1,000 video courses as well as an innovative home exercise platform and mobile app. Those figures alone should may any clinic director’s eyes light up! You’re probably familiar with ROI: Return on Investment. So I’m coining a new phrase: ROEd Return On Education. 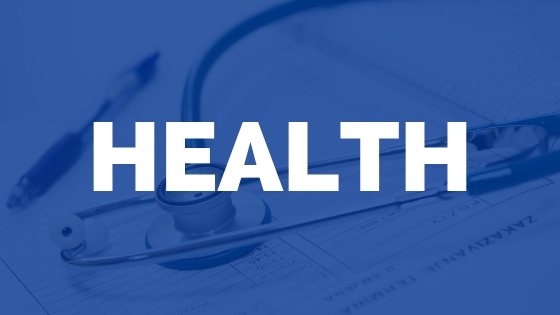 Not only did this health care group experience cost savings in staff clinical education, they decreased the no-show / cancellation rate after implementing the MedBridge platform. That is a significant return on education! 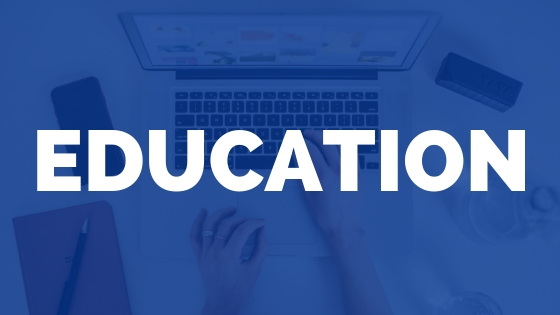 For organizations that have established continuing education budgets and want to find ways to expand education instead of cutting education funding, the MedBridge enterprise solutions should be discussed at your next team meeting. * You can download this review as a PDF and present it to your clinical education team or supervisor as part of your proposal. 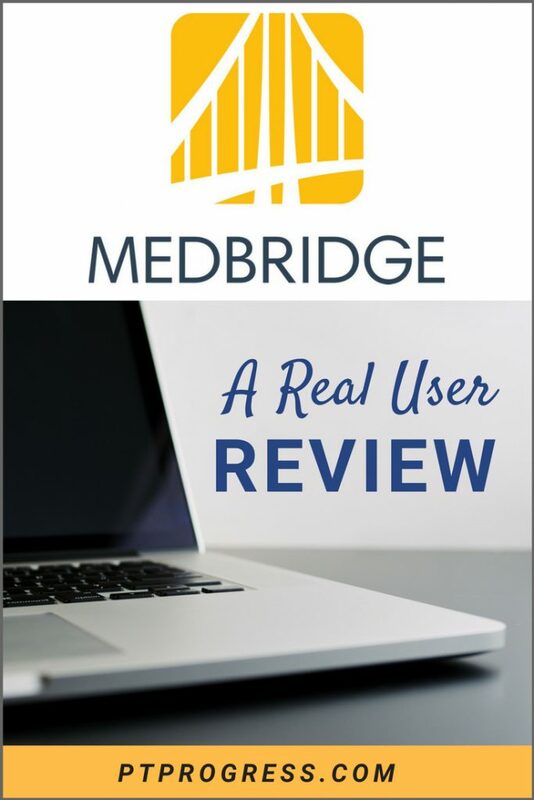 As part of this MedBridge review, I want to highlight the features that set it apart from other platforms. Below are some of the key elements of MedBridge that I’ve found to be very useful. 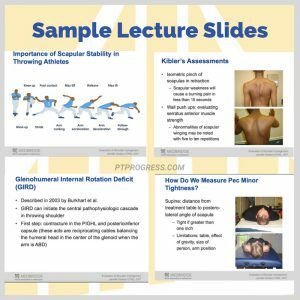 Looking for a specific topic such as Shoulder Impingement and Treatment? You can use the organized search feature on MedBridge to quickly narrow down your search by topic, specialty, body region, and even course difficulty. Under each course, you’ll find the total approved hours for your state and specialty. Above you can see that I’ve selected Physical Therapist in Michigan and I can quickly switch views to show offerings for OTs, ATCs, SLPs and Nurses. Before you even start a course, you can read the full description to learn more about the objectives, instructor, and materials covered in the course. As you can see below, this view gives you a quick glance at the relevancy of the course, so you know if it fits your needs before you commit the time to watch the course. I really like the integrated quiz feature within the courses. Not only does this require you to apply the knowledge you’re learning, it challenges you to draw on your previous clinical knowledge and expertise. 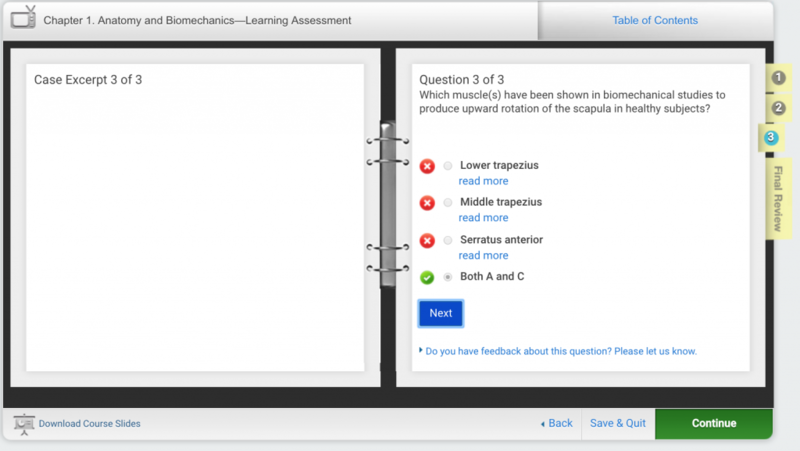 Below is an example of the integrated quizzes I encountered when taking a course on the shoulder. Also, it should be noted that your score on the quiz doesn’t have an effect on the completion of the course. If you prefer a hands on pen and paper approach, don’t worry! I love that you have access to the powerpoints and can print each lecture if you want a paper copy. Even better, the slides are full size and color and they do a good job in keeping the text concise in the slides. Most organizations require annual training on topics related to OSHA, HIPPA, human resources, and safety. The Learning Management System allows organizations to distribute this training among its employees at a fraction of the cost. Within the basic membership of MedBridge, you have access to multiple certification prep programs. Some of the most common include the OCS exam prep, NCS exam prep, and CRRN prep courses. You can even complete MedBridge Certifications on various topics to advance in your career and knowledge base. All of the courses you find can be accessed on your mobile device, making it easy to consume courses on the go. You can download the course content and materials and even take the online quizzes through your phone or tablet. 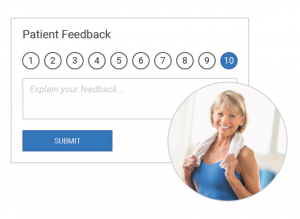 Getting feedback from your patients is simple with the integrated satisfaction survey. 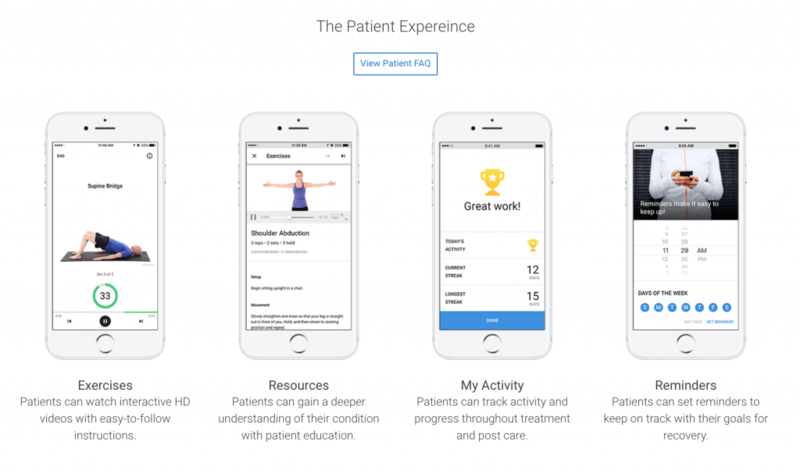 The team at MedBridge is continuing to develop new tools that will make it simple to communicate with new patients and to promote engagement, which can lead to decreased no shows / cancellations in the clinic. With reimbursement hanging on a thread for many clinics, it’s important to have a strong measure of tracking outcomes. These tools help to reduce operational overhead and to save time by identifying gaps in outcome scores and highlighting solutions to improve profitability. On average, clinicians who use the MedBridge HEP solution with EMR integration save 2 minutes per patient. That amounts to an average of $4,500 in savings per clinician per year. When you sign up for MedBridge, you get access to MedBridge Go, one of the most smartest HEP programs I’ve ever used. I could write an entire review on their HEP alone! 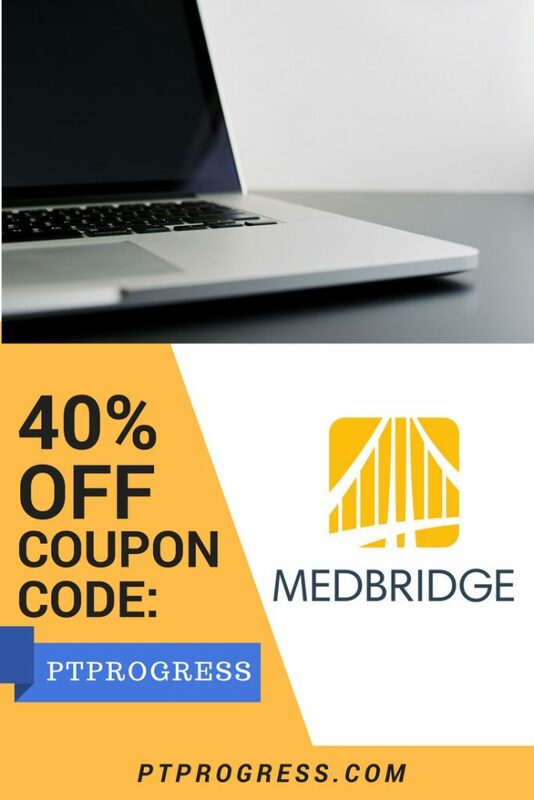 MedBridge has agreed to provide my readers with a 40% off MedBridge Coupon. 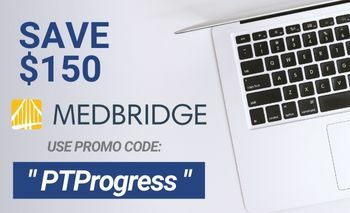 Use the MedBridge promo code: “PTProgress” to save $175 on MedBridge, their largest discount available. As a clinician, I enjoy teaching others about resources that help them develop professionally. When I find a tool like MedBridge, I want my colleagues to know how helpful it can be for their education and professional development. Personally, I think MedBridge one of the best CE platforms available. 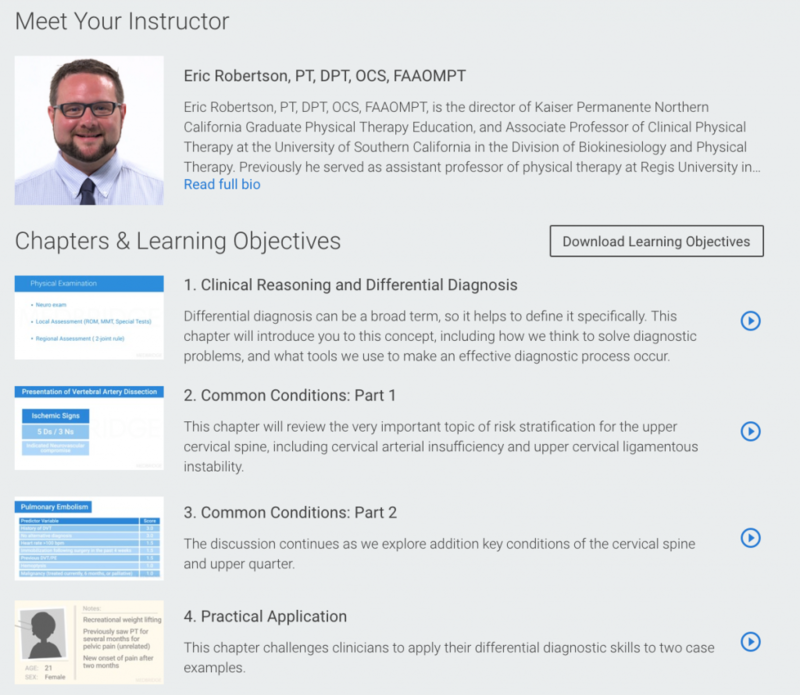 Not only does it provide clinicians with education credits via high quality courses, it fills the gap by providing them with resources for patients as well as meeting compliance requirements within an organization. MedBridge is like an extension of your clinical ed team, compliance / quality measures team, and customer retention team. Make them a part of your organization to maximize the investment in your clinical staff and patients.